I crossed two things off my life-list within 24 hours. A life-list is also known as a "bucket list". It's a list of all the things you'd like to do before you're gone. Anyway, I crossed two things off within 24 hours and I was super excited about it. The first thing was seeing and photographing a double rainbow, which I did Thursday evening. It wasn't a "perfect" double rainbow, but it was, in fact, a double rainbow, and I did, in fact, photograph it. Yay Me! The second thing came Friday morning when I had taken the day off work for a "Misty Day", and I went out to try out my brand new macro filters I had purchased. Let me just say that the macro filters are AWESOME. I was beyond giddy while using them, and I can foresee my being giddy for a very long time while using these filters. and this caught me completely by surprise. as fast I possibly could, but he was running like lightning! 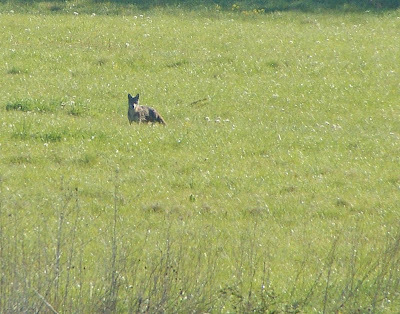 However, I DID photograph a coyote! Even if they aren't great pics. 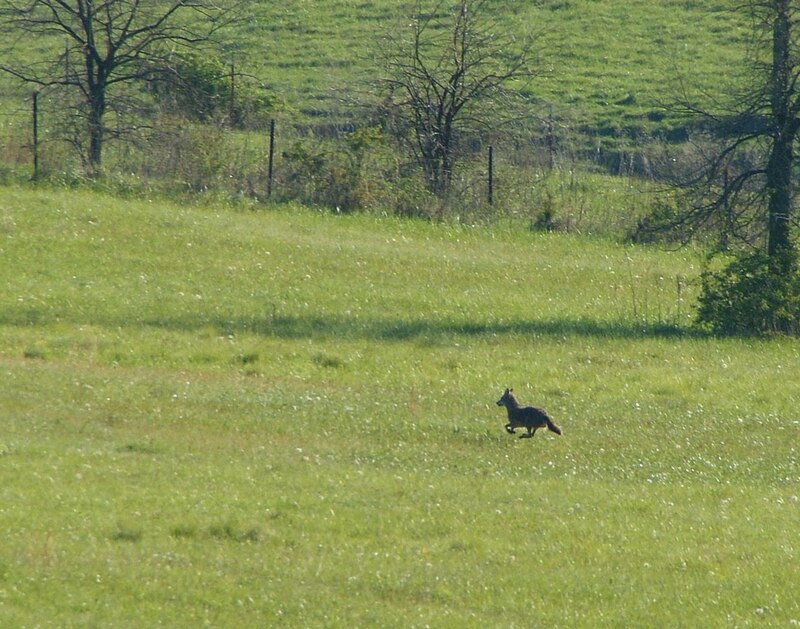 And a most elusive camera critter Wile E. Coyote is, too, Misty. Wow for getting the filter off in time! Congratulations also on the double rainbow. They're hard to find, almost as elusive as your 4-footed friend in the magic Reeboks. 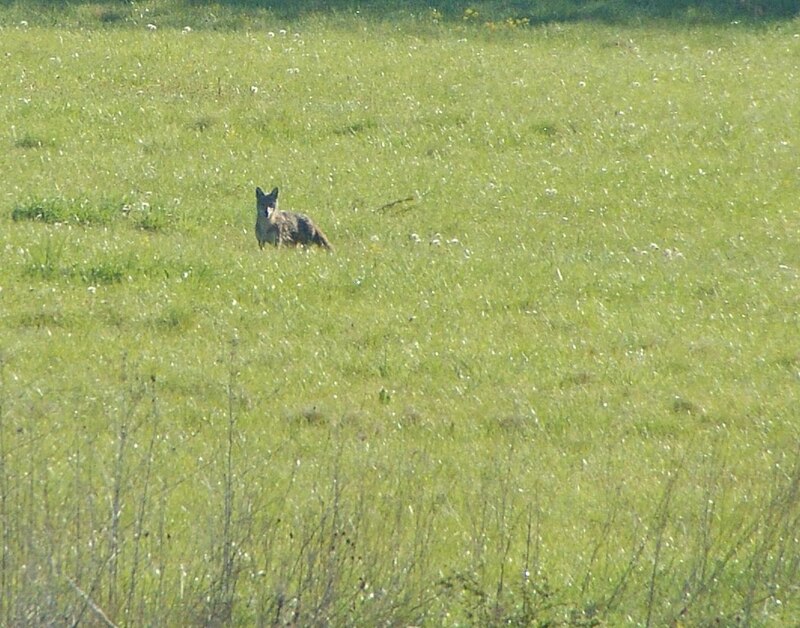 A coyote! What a marvellous experience! And congrats on your two great moments of photography. Hi! I have experienced the same. We had double rainbows when we shifter to this house 3 years ago. The photos I took were not clear though. And I wish those macro lens are easily detachable. Wow, quick thinking and well captured. coyotes have a way of catching you completely by surprise. good for you! How cool! We saw several when we last visited the US but we didn't manage a photo. At least you got so to show. I just got smudges!! Boom & Gary of the Vermilon River, Canada. A magical encounter shared thanks to your nimble fingers. Congrats on your coyote sighting, Misty! And I am sure the double rainbow was beautiful too. Happy Mothers Days and have a great weekend! Wooohoo that was so cool! When will I gonna shoot a running coyote? Haha, I will someday! Nice shot! Congratulations on both your achievements! They are hard to photograph and it is a thrill to get any type of photograph of them. I got my best shots in Cades Cove and Shenandoah National Park. I am going to write a post about them in the near future.